Making the World Series after three sub .500 seasons… and more! Although the New York Mets are down two games to none in the World Series, the team has already accomplished a lot just by getting into this post-season. Not many pundits had the Mets making the playoffs, let alone make it to the World Series. To help quantify the above statements, let’s look at two stats. The Mets are one of 12 teams in MLB history to have made the World Series after three or more seasons with a sub .500 record. 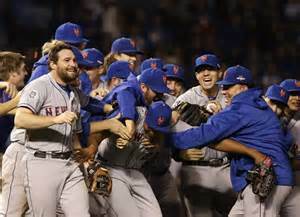 After a .548 winning percentage in 2008 (89-73 record), the Mets went six seasons with a winning percentage under .500 for six straight years before going 90-72 and making it to the World Series this season. The 2006 Detroit Tigers hold the record for most sub. 500 season before making the World Series with 12. Here’s a look at those 12 teams that had three or more seasons under .500 before making the World Series.